Looking for best approaches here. Say I have a buffer~ object, filled with a bit of silence of unknown length (maybe not *exactly* 0.0 values, but close), followed by a few seconds of a tone comprised of repeating waveforms. I hesitate to say "single cycle", as each cycle might be composed of multiple zero crossings - these are not single cycle (e.g. 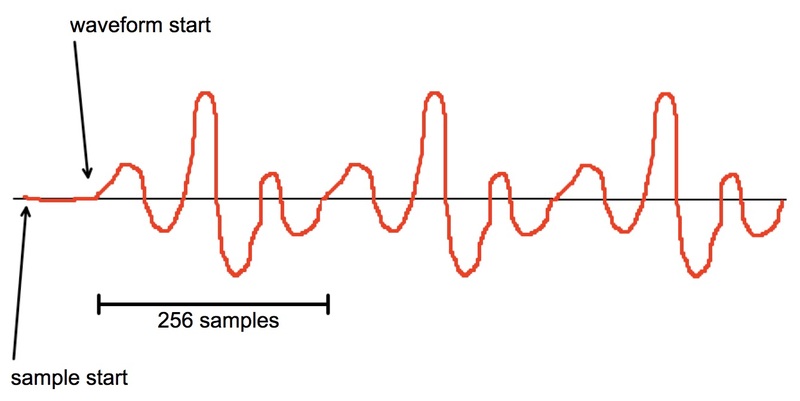 sines, trianges, sawtooths, etc..) in the purest sense - they're complex waveforms. I *do* know that each repeating cycle is 256 samples in length. What would be the best approach in extracting the 256 samples that comprise this "single cycle"? I've tried simply stripping the beginning silence using automated approaches, and then counting 256 samples, and though it sort of worked, it was not precise enough, not sure why. Possibly because the sound takes some time to steady, or perhaps because my silence stripping was not accurate enough. When I visualize the buffer~, I can clearly see the repeating patterns, so I figure there should be some way of perhaps taking adjacent 256 sample buffers, and measuring the absolute difference between the corresponding samples in each buffer. The 256 sample range which generates the least total difference with the 256 sample ranges after it is the "winner"? Why not normalise the buffer, and start searching for first max sample level position and following 256 samples. Could work in case no other things beside the waveforms are getting into buffer, like clicks pops or whatever. Then it would be a matter of rotating the buffer to get the waveform in question. For looping it it would actually not matter, Are this "tones" composed of absolutely indentical cycles of 256 samples ? Apologies for the non-reply, I never received an email update of your response! And as far as the waveforms being absolutely identical - technically they should be (they're being generated by a digital synth playing a wavetable), but they're being recorded in the analog domain, so they may not be exactly identical. Close though. If You'd like to try version with buffer copy, let me know. I will upload it and external. Thanks for that - nicely done. Re: efficiency and using an external version - thanks but not necessary, as speed/efficiency is not a requirement for my use case. the shorter the cycles are, the better it will work to match against the "least total difference". if a cycle is 10,000 samples long you might as well find the best match at 2 samples off. Hi Roman - no each cycle is by definition only 256 samples long. Thanks - perhaps I should give more information re: what I'm trying to do. I'm trying to extract the wavetables from the ROM of a synth. There are 128 "frames" for each wavetable (each frame is 256 samples), and there are many (roughly 60 off the top of my head) different wavetables. I have an automated approach in Max that allows me to select each wavetable, and in turn, each frame of each wavetable, for playback (and in turn, recording into Max). So for each wavetable/frame, I would like to trim the recording to a single frame, and then reassemble those 128 frames into the original wavetable. I see, in that case even searching for the peak value might not be helpful, wavetable could have it's peak in the middle or anywhere within the 256 samples. Exactly - I'll keep plugging away at it and see if I can figure it out. Thanks regardless for your ideas!